Paradisus Playa del Carmen La Esmeralda is a family-friendly resort in Riviera Maya, Mexico featuring 512 suites. Families with children of all ages enjoy everything this property has to offer, and it makes a great place for multigenerational families to go on vacation. The beachfront location, wonderful customer service and spacious rooms have always been visitor favorites. With the recent opening of a waterpark on property, guests have even more to be excited about. Located conveniently outside of the Kid’s Zone area, this waterpark allows families to have a unique water experience. 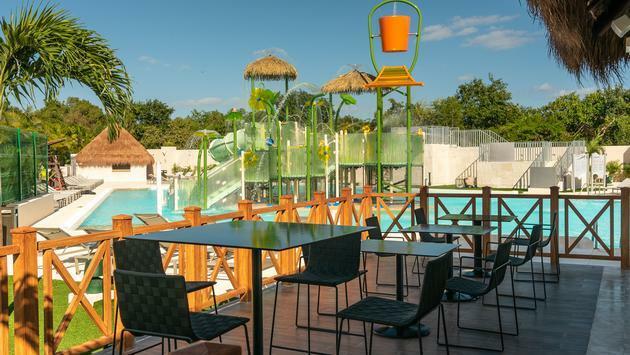 The large pool is home to five waterslides and dumping buckets for guests to enjoy, and the smallest pool allows the toddlers to join in and safely splash around too. The waterpark isn’t the only thing Paradisus Playa del Carmen La Esmeralda has in store for guests. The resort will be starting to incorporate new activities for children including teen pool parties, a snack stand equipped with a children’s menu and themed parties. Visit the Paradisus Playa del Carmen La Esmeralda website to learn more.